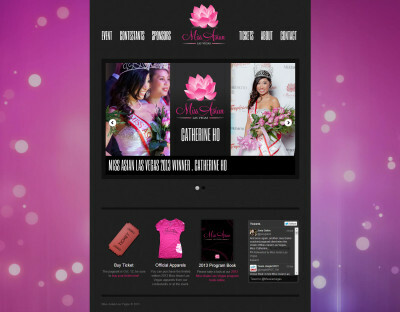 2.5 weeks prior to the 2013 Miss Asian Las Vegas Beauty Pageant, we were referred to the pageant organizer for a full site revamp to better represent the event due to the high visibility. Under the tight schedule we were able to fully refresh the site inside and out with minimal downtime. It was also an exercise of effective communication on both ends due to the fast turn-around and fluidity nature of the event. The event was a great success and we were very happy to have been a part of it!